In 2007 the container ship MSC Napoli, carrying 2323 containers, sank in a storm off the coast of Dorset, England. Many of the containers washed up on shore and people flocked to the beach to grab the booty from the broken open containers. But then they started breaking the sealed containers open while the confused police watched, not knowing if it was salvage or theft. and declared the bikes the property of the salvors/thieves. Austrian artist Christian Kosmas Mayer watched the debacle unfold on TV with the rest of the world. “The whole story was fascinating to me and I read everything I could find,” said Christian. When the opportunity came up in 2018 to make an artwork at an emergency mooring station for ships in trouble on the Danube in Austria, Christian's mind returned to shipwrecks and to the Napoli. 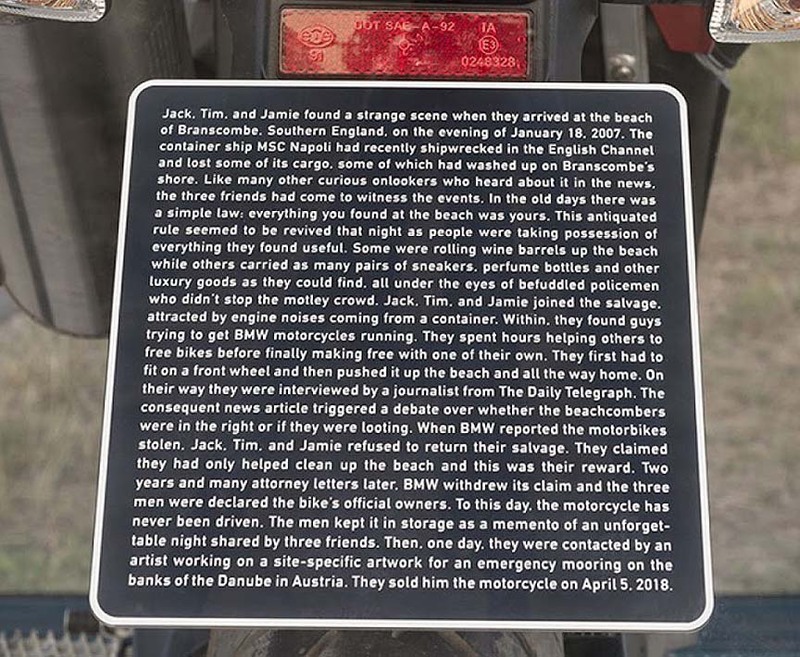 Christian agreed to buy the bike from the friends in April 2018, after proving that BMW had relinquished ownership of the bike. 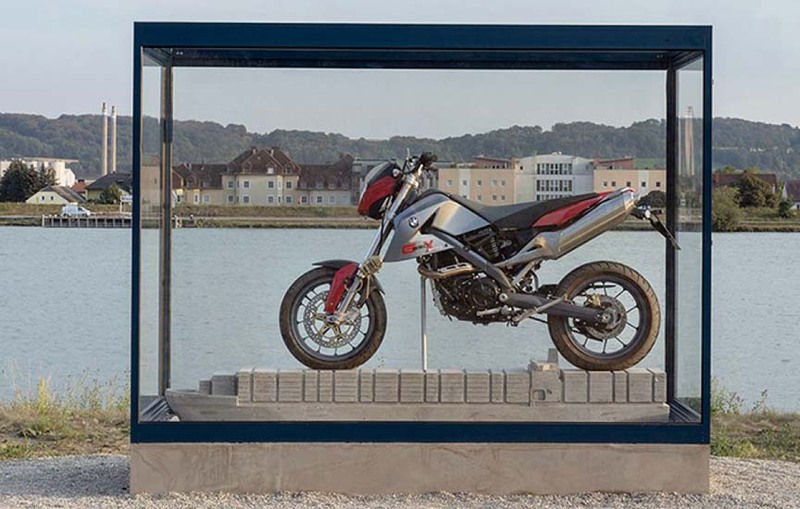 He mounted it in a glass case on top of a concrete model of the Napoli at the side of the river Danube in Austria – he named the installation Cycles Galore! I remember that incident well. It brought to the public's attention the rather archaic sounding 'Receiver of Wreck'. One aspect that sticks in my mind was that of a family who had sent a crate of their household possessions from Sweden to Cape Town and saw it being looted in TV news reports. A woman whose belongings were looted after they were washed on to a beach from a grounded container ship today pleaded for their return. Anita Bokdal, 60, lost around £20,000 worth of property including family heirlooms after the 62,000-tonne Napoli was disabled in a severe storm and deliberately run aground off the coast of Devon. Mrs Bokdal's crate, from which only a fraction of her goods have been recovered, was marked Anita and Jak Bokdal, and was being taken from Sweden to South Africa. Her possessions came from one of more than 50 containers washed up on the National Trust-owned Branscombe beach, part of the area's World Heritage coast. Today Mrs Bokdal recalled seeing her property being taken from her crate on television as she sat at home thousands of miles away in South Africa. Visiting the beach for the first time at the invitation of East Devon council, Mrs Bokdal appealed to those who may still have her possessions to return them. She said she had been "shocked" by what she had witnessed on TV as the drama had unfolded and claimed that the looters had acted "like a lot of savages". "I beg them to give it back," she said. "I feel very sad." Mrs Bokdal, who has a home near Stockholm and a vineyard in South Africa, said she had come to the UK in a last attempt to track down her property. She said she had "about 2%" of the goods back, including coffee cups and plates, a carpet and some paintings. Whatever happened to honesty and plain human decency? We grew tired of decency. Griff said it better. But it seems that good manners and common decency are dead. And since the election of Trump it's gotten worse, it seems like people just want to hate for no good reason. It sounds like the Receiver of Wreck dropped the ball on that one. I'll have to ask the people who work in your vineyard in South Africa. I have always been somewhat astonished that the King of Spain or Lloyds of London can come forward after an intrepid explorer and diver finds a 500 year old wreck on the sea floor after 20 years of looking and say "Thanks, old chap, that's our gold and we'll take it from here."